A. It is vocational position within a bureaucracy and is expected to be professional (paid) unless clarified as being a “volunteer pastor”, which is usually related to some combination of the clergy’s generosity and the financial need of the local fellowship. This is different from “general vocation” of a “full time Christian”, such as a speaker, author, influential Christian who has a presence in the marketplace, faith missionary, etc. This is a “particular vocation” and, though it claims to be the “shepherd-and-teacher” of Ephesians 4:11, it is not informal as Paul intended in that passage and it adds several layers of bureaucracy both above and below it, which are not described anywhere by Paul. B. Clergy are seen as somehow “chosen by God” or “allowed to lead because God chose them”, or their decisions, though flawed, reflect “God’s will” for the congregations which those clergy lead. Usually, this is not defined specifically, but it is an undertone often referred to by terms such as “Godly authority”, as opposed to other kinds of authority, which clerical circles often leave undefined. C. These clergy often execute decisions and carry-out vocational duties concerning the congregations they lead, including monologues every week, curriculum maps of “Bible study groups” or “smallgroups”, and other types of smaller gatherings and events. They occasionally have governing influence or delegate others to determine which Christians are involved in which Bible study groups or, at least, they retain the power to rearrange which Christians are involved in different specific smaller meetings. They also oversee scheduled events, the appointment of volunteer and paid leaders within the congregation. They may operate alone or as a hierarchical team, often consisting of “associate pastors” and the like. D. Typically, the only scope of influence which is beyond their reach is a board of elders or membership body or denomination/“affiliation”, typically some combination thereof. While these other bodies retain the power to appoint and dismiss the clergy, their appointment is seen among the masses as somehow reflecting the will of God in the earth and should not be questioned or disputed. And if these appointments are to be disputed by anyone who is administratively below the clergy, there are heavy rules and regulations for doing so, which, essentially, render those disputes to be ineffective. E. These aspects and descriptions of clergy are rarely outlined, but they are almost always followed perfectly in their actions and in the actions of their organizations. Legal justice systems often refer to this as “de facto” policy, where the outcomes are not stated, but they result, nonetheless. 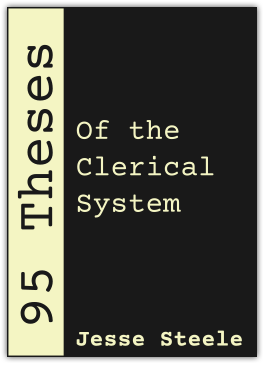 It has been four and a half years to the day since 95 Theses of the Clerical System was first published. While the five-point working definition of the “clerical system” (above) stands and needs to remain in its expanded form, a more concise definition is both practical and more helpful. After four years to ponder the matter, it is time to include that in this 2017 note. a public utility to be managed by a bureau. If a died-in-the-wool “cleric” in the truest sense learns that Christians are having fellowship without the cleric having all of their names and addresses, that cleric will feel threatened, violated, deprived of some purported “leadership rights”, or otherwise harbor offense. The cleric will show this by “expressing concern” for the Christians’ well being and will exhibit other “control cloaked by care” behaviors and rhetoric, especially the self-deceptive kind. Formal smallgroups are centrally-planned by definition, not by a government bureaucracy, but by the “Church bureaucracy”. Such structure keeps died-in-the-wool clerics from feeling offended more than it helps those smallgroups exist in the first place. The key to making smallgroups thrive is not to sanction them from within a clerical structure—essentially hanging apples on a group of trees and calling them an orchard rather than, rightly, a creative grocery—but to encourage and empower Christian life outside of and completely free of any clerical framework whatsoever. Tell Christians, “The Church is no longer assigning your friends to you, you’ll have to go make friends on your own,” and they will ditch their anemic social skills and eventually gain mastery over the art of friendship. Jesus viewed that mastery as “loving one another”. Tell Christians, “The Church is no longer spoon-feeding you, you’ll have to read the Bible and pursue God without a sheep dog gnawing at your heels,” and Christians will rise up to learn the Word of God and pursue Him in prayer and obedience like Sunday morning never dreamed of. Jesus viewed that life pursuit as “loving God will all of heart, soul, mind, and strength”. So, what’s in the way? …a domineering, self-rationalizing, self-justifying, self-perpetuation, self-important, easily-and-often offended, Church-run public utility best known as the clerical system. Only God can manage a Christian’s life. He doesn’t need our help or our “fence laws”. Treating the Christian life as a “public utility” that needs a bureau to monitor and plan its existence is the height of arrogance and megalomania. More relevantly, it is the telling litmus test of the clerical system. Try to have any Christian life -related activity—fellowship, discipleship, training, teaching, Bible study, worship, group prayer, or outreach—without structuring that activity under a watchful administration of formal oversight and someone will object. That someone only objects because, in the heart of hearts, that someone is sold-out to the clerical system. If such a “someone” is not offended by your Christian life, then your Christian life is governed by the clerical system. The Bible never treats the Christian life as if it is a public utility. Christian life is LIFE—it is organic and spontaneous with an innate structure and mind of its own. That life needs Bible, fellowship, training, outreach, prayer, worship, good works, the fruits of the spirit, the meditations of Joshua 1:8 and Philippians 4:8, and should eventually produce the Spirit demonstrations of the Book of Acts and Mark 16:17-18. But, trying to manage Christian life, or otherwise “regulate” it from the top down, kills that Christian life and all that is left is a gorgeous cadaver that neither Heaven nor Earth nor even Hell is any longer interested in. 1. This system and its traits are seen nowhere in Scripture, nor are they seen in Statements of Faith in the Body of Christ, whether congregational fellowships, missions fellowships, charity fellowships, Christian-led businesses, or Christian institutions of education. 2. It has been upheld as the only valid means of “Christian fellowship” and Christians who refuse to participate in it are often regarded as “Churchless Christians”, an oxymoron since the Church is the Body of Christ and every Christian is, by definition, in the Body of Christ. 3. Christians who have no fellowship with other Christians might rightly be labeled “fellowshipless Christians” or “hermit Christians” if terms are to be created. Terms such as “Chruchless Christian”, “Christian without a church”, “Christian who doesn’t have a church”, and questions akin to, “Does that Christian have a church?” are each and all absurd. 4. Christians who depart from the clerical system to have fellowship in their homes are not necessarily guilty of being “hermit Christians”. Clergy who reject such non-clerical fellowship, merely for being non-clerical, are guilty of trying to make them “hermit Christians”, despite those Christians’ commitment to only having fellowship that proves effective. 5. The clerical system has also spoken of the Body of Christ in the plural… as if Jesus is a Siamese twin with one head and multiple bodies. A “church”, so the clerical system says, is something Christians can switch between and the clerical system prescribes certain permissions from clergy that are necessary for Christians to make such switches. 6. There is only one Body of Christ, one Church, and one Head of that Body and it cannot be abandoned or switched. Departing from a clergy-led fellowship is nowhere described in the Bible as being equal to “walking away from Christ”, yet the clerical system defines a Christian who does not submit to a clergy as lesser or not even valid. While there may be many Christians who do not have fellowship with other Christians, they remain within the Body of Christ. 7. It has promoted and combated culture rather than focusing on the Great Commission, spreading the Good News that Jesus Christ is the Lamb of God who takes away the sin of the world. 8. It has confused bureaucracy with the “Christian family of God”, thus radically increasing heartbreak everywhere in the Body of Christ. 9. Its very existence creates platforms which demand undue loyalty to a few, arbitrarily chosen leaders. This has been exploited by heretical teachers who would not otherwise have any noteworthy influence within the Body of Christ. Despite this, the clerical system has not taken the wise choice of recommending its own necessary extermination. 10. Heresies preached from platforms within the clerical system have been pushing, in recent decades, to unite religions—an obvious leap toward conformity in the spirit of the Antichrist. Although Biblical preachers in the clerical system have opposed such heresy, they have not used their platforms or powers to unite local congregations—a real, Biblical, and necessary form of Christian unity—the only unity that can effectively combat the counterfeit unity of the spirit of the Antichrist. Instead, Bible-believing clergy have promoted division, territorialism, and schedule conflicts among the many Christian congregations that exist within a few miles of each other. 11. It has mismanaged financial resources of the Church by erecting numerous and expensive buildings, most of which remain empty except for a few hours each week and, at those times when they are used, they are rarely filled to capacity. 12. It has scheduled congregational gatherings at times which conflict with each other, without any concern for the lack of fellowship among Christians in their local region or cities. When Christians take time away from their regular congregations to meet with Christians at congregational gatherings different from their normal routine, those Christians are falsely, and therefore, by definition, “Satanically”, accused of “not being faithful in fellowship”. 13. It has engaged in the most obvious forms of nepotism without facing any meaningful confrontation. 14. It has demanded that its methods, which are found nowhere in Scripture, are the only valid form of Christian fellowship. 15. When Christians disagree with the methods of any specific clergy, that clergy is left to govern the manner in which such grievances and disagreements are heard and addressed, often to the effect that the grievances are rendered either invalid or else regarded as valid with little or no consequence. Even so, clergy are, in large, permitted to maintain the systems which give this power and their system itself is not called into question for anything akin to a “conflict of interest” nor has any strong voice in the Church rebutted this egregious procedure with the truth, that neither judge nor juror nor bailiff should oversee a trial in which he is a part. 16. It has erected countless doctrinal disputes used as the demarcation of territories more competitive than street gangs from theologies which were written after the canon was closed. Yet, the division that has resulted from these doctrines has been tolerated as if it is necessary in order to uphold teachings and Christian mandates from Scripture, notwithstanding its absurd claim that such division is the ostensible vehicle by which Christian unity can be reached. 17. When different congregations are divided along lines of these invented doctrines and crafted disputes, rather than seeking fellowship to overcome their contrived misunderstandings, leaders in the clerical system, seminary teachers notwithstanding, have made it common practice to misrepresent opposing views before their audiences in the absence of their opposition—a practice which is unbecoming of any rightful academic or Biblical instructor. Despite the fact that the clerical system evades and discourages the necessary fellowship that could reconcile these manufactured differences among Christians, the clerical system pretends to justify its own existence on the supposed basis that “Christian fellowship” is necessary. Such self-contradicting audacity is rarely demonstrated elsewhere, even among other forms of blatant hypocrisy. 18. This unethical method of misrepresenting opposition in the absence of opposition has been carried over into the clerical system’s way of informing young Christians about non-Christian ideas. Inevitable as it is foreseeable, young adults are wholly unprepared for real opposition to Christianity and they often exit from the Church after having real encounters with the outside world. Leaders and parents in the clerical system have either pretended to be surprised at these inevitable results—indicating their disingenuousness—or else been genuinely surprised—indicating their incompetence as leaders. 19. Its very existence has cultivated a superstitious assumption among the masses, both Christian and non-Christian, that clergy are somehow “more spiritual” or “closer to God”, in some manner or another, than any other Christian. This superstition has developed consistently, predictably, and without exception since when the clerical system was first adopted by the Church. Though many movements have downplayed this elevated status of clergy, the superstition has remained. Despite this, abandoning the clerical system was never given consideration. 20. It has squandered the most talented and business able Christians, who would serve the Body of Christ much better by evangelizing and mentoring in the marketplace and teaching marketplace knowledge to the Body of Christ, but who could only have this increase in ministry were they not involved in the clerical system. As a result, both the marketplace and the Body of Christ have suffered both independent and intertwined injury. 21. It has engulfed, exhausted, and burned-out many Godly, gifted, and Biblically insightful men by teaching them that the best way for them to minister to the Body of Christ was by, themselves, partaking in this clerical system. Under this stress and exhaustion of behaving in an administrative manner not found in God’s plan as laid out in Scripture, they have frequently fallen into sin, which might not have happened otherwise. 22. In those cases of clergy falling into sin, and only when it is finally exposed, the masses of Christians involved in the clerical system dispensed of those clergy like dirty diapers, rather than embracing them in Christian love, without even considering whether to abandon this system. This has all the indications of an evil and predatory design, yet the clerical system writes it off as “unfortunate” and “necessary imperfection”, maintaining that the clergy with exposed sin be the scapegoats. 23. It has paraded itself as being “necessary” not only for valid Christian fellowship, but also to be the primary recipient of financial giving. Christians who give finances to other fellowships in the Body of Christ, rather than to the same clerical congregation at every time, are regarded as not obeying the basics of Christianity. 24. While the clerical system requires that all Christians participate in a clerically-led congregation, it also requires that monies be paid to their treasuries in order to participate in those congregations. This is done despite the fact that clerical system often teaches that Jesus “paid the price” for our sin at the Cross and that this is the basic foundational truth of being a Christian. The price paid to “be in the Body of Christ” was paid at the Cross. Financial giving to a clergy-led congregation has been emphasized even more than the simplicity of “Substitutionary Atonement”, the teaching that Jesus took our punishment for sin. In this, giving money to clergy, specifically, seems to have been the clerical system’s interpretation of “giving first fruits” to God. Together, these form a two-pronged and unwritten false doctrine that the clergy, in financial terms, are God’s proxy among the Body of Christ: A. That Christians must pay the price to be in the Body of Christ and B. that the clergy are a mediator, between Jesus and the Church, through which this entry-level/fundamental price is paid. 25. It has received extensive amounts of money, paying fat salaries sufficient to feed, raise, and educate families of four and greater. Such lifestyle is wholly acceptable to anyone who generates prosperity in the marketplaces, as a city on a hill to the world, and gives money to the Great Commission. But it is not becoming of funds received as the “fundamental basis of giving first fruits” among Christians. This abuse of finances has increased the ratio of staff among the Body of Christ, without showing evidence that it furthers the primary objective of the Church, which is to fulfill the Great Commission. 26. Clergy within given regions meet collectively, but without subjecting themselves to the same scrutiny, investigation, or inquisitive permissions that they require when members of their respective congregations meet together. And they have provided no explanation for why this double standard is acceptable in light of our Lord’s Two Great Commands. 27. It has promoted itself as the only valid method of Christian assembly, yet, through its doctrines, its schedules, and its financial requirements, kept the Body of Christ segregated along a number of lines and kept itself, overall, financially inefficient. Still, it demands more money, prays for unity, and continues this contradiction between action and prayer—a contradiction which has proven profitable to a select few and effective for none. 28. It slanders, punishes, and banishes anyone who questions the Biblical grounds of its origin and does so on grounds which are ostensibly “Biblical”, though it does not give any Biblical defense for its most consistent and decipherable traits, elaborated on in items A-B of the Preamble of these 95 Theses. 29. It encourages long monologues, performed by one individual each week, during which time none are permitted to raise their own questions nor to practice their own ability to express the Gospel or the Christian life. It does so despite the conversive manner of assembly, which is both assumed and governed by teachings of the Apostle Paul in his first letter to the Church at Corinth. So, Christians are reared unpracticed in group communication. Yet, when it realizes that Christians are less than capable of expressing their own beliefs, the clerical system presents the solution to have more “training classes” with monologues. When field experience is part of the clerical policy to train Christians how to communicate the Gospel, it is often coupled with monologues and classroom time. Personal experience and practice, though they were the method of Jesus’s “shepherd-teaching” style, are never considered as the proper method of learning. 30. It has claimed Ephesians 4:11 “shepherds” as its entire basis for existence and function, while completely assuming the de facto working definition of its job description (including Preamble items A-B). Though this definition is entirely contrived and assumed, if that extra-Biblical definition of the clerical job description is questioned, the person questioning it is regarded as questioning the authority of the Bible itself. This would be no different than a man saying he must have water to survive, but then drinks poison claiming his desire for survival. The claims and the actions are nothing alike, yet the clerical system regards them as one-in-the-same. 31. Its contradiction between stated objectives and its actions has not led to any re-evaluation of its own rationale for existence. 33. The only fellowship which has so openly stood against this clerical system is the “Local Church” movement, founded by Watchman Nee. It has been investigated and found approvable by the Christian Research Institute. That movement remains extremely isolated from the rest of the Body of Christ and its teaching content is dependent on its founder’s successor, Witness Lee, whose strange choice of words have been a significant factor in this isolation. Much of the movement’s dependence on Lee is from their unwillingness to participate in any clerical system. So, other decent Christians in the Body of Christ have not had the mutual and much needed benefit of fellowship with the “Local Church” movement of Nee, which would help both the “Local Church” movement and the rest of the Body of Christ. 34. Though the system causes many forms of disunity and lack of fellowship between Christians, it claims that it is necessary in order for Christians to have valid Christian fellowship. This is a contradiction without any explanation. 35. It has turned away many capable, desirable candidates for leadership in projects for missions and local ministries, giving the most ridiculous of excuses for doing so. 36. It has suspended some of the most common-sense and necessary actions until it can review and approve them, and, when so suspended, it has often neglected them and given no response one way or another to those who wait. This has led to the continuance and increase of many problems in the Church, which would have been easily solved without the clerical system slowing the use of common sense. 37. When Christians begin to depart from its ministries, it has covered-up some of the most important facts of truth, thereby damaging the reputations of innocent people while preserving, on false grounds, the good reputations of unworthy leaders and overseers. 38. It has failed to intervene in the most petty of squabbles and thus, many disputes, which could have been easily headed-off, spiraled into a chaos that few could have imagined possible, given the simplicity of their origins. Many friendships have turned hostile in the aftermath. 39. It has cultivated a cultural atmosphere in which Christians dispute matters of fashion, artistic preference, musical style, and even the colors of paint, fabrics, and other physical materials that construct their buildings. These squabbles have distracted from fulfilling the Great Commission, which, Biblically, should be the main priority of the Church. 40. It has spoken flatteringly of the extra-Biblical, man-made, clerically-led institutions, responsible for these embarrassing activities, persuading nearly the entire Body of Christ that this disaster is the Body of Christ itself in essence. And it has done so without consideration for the depressing effect it should rightly have on Christians who, given this categorical claim, should conclude that these heinous things would not have happened if there were no Christians. Nor is there any indication that the system has considered their own absurdity: In claiming that the Body of Christ is messed up to this great degree, they directly slander God Himself. 41. It has utterly neglected proper explanation of the simple, comfortable, and good function of the prophetic office, which is intended by the Lord as something like a “personal leading of the Holy Spirit”, which Christians can experience during their prayer time, except that the prophetic function is for the corporate Body of Christ, usually with local or other demographic emphasis. Like any “leading of the Holy Spirit”, the prophetic ministry should be evaluated against Scripture and without any other biases. 42. In some cases, the clerical system has spread lies about prophecy, not clarified this simple truth of its function, confusing the people with the false notion that a “prophecy” is a claim to be authoring more Scripture, and failed to advise otherwise when less experienced Christians come to that conclusion on their own. 43. In other cases, where the prophetic ministry has been accepted and explained as it should be, prophetic messages are filtered, prepared, and edited, as if prophecy is subject to a prophet’s own interpretation, rather than being carried along by the Spirit. These modifications have all appeared to fit agendas of finances, politics, reputation, and support for the continuance of the clerical system. 44. In other cases, clerical leaders and their supervisors have distorted the function of prophecy, using it as a cudgel, claiming that Christians in their congregations are obligated to listen to them as prophets, all the while using manner and rhetoric like that of either the most pretended piety or else that of the most ungodly of tyrants. 45. Its leaders have stamped out many of the prophetic voices and messages from their midst when those prophetic messages did not suit their liking. When they did so, they never admitted their actions and failed to give ingenuous rational if they ever did make such an admission. 46. In the clerical system, Christians who speak truth not to the liking of other Christians are ignored, rejected, denied appeal, denied hearing, expelled, and others are told not to let them speak. Supposed Christians who respond in this heinous way are not held accountable to obey the processes of fair dispute laid out by our Lord in Matthew 18:15ff. and their gossip is overlooked while they remain on staff and in places of high authority and offices of clergy. 47. It has failed to investigate egregious matters of misconduct and has spread unfounded suspicions about its enemies where no misconduct existed. 48. It falsely accuses passionate Christians, who radically and nobly, yet imperfectly as to be expected, pursue God’s love and His commands, mislabeling them as “gossipers”, “discontents”, and “hate-mongers”, while encouraging and turning a blind eye to those who engage in actual gossip, slander, and make errors where actual damage can be found. 49. Its leaders have stamped out many of the most creative, beneficial, and useful works in advancing the Gospel and ministering to the Body. When these ministries have been so frequently stamped out, the only understandable interpretation can be that they threatened the power and credibility of the clergy, as well as those who pull their strings. 50. When the clergy have supported or engaged in the most creative, beneficial, and useful works of ministry, they have been shouted down by their own leaders—whether denominational or congregational. When those leaders have supported the clergy they oversee, other clergy have, in turn, condemned them. This is not an atmosphere of universal Christian fellowship that is focused on collective achievement of the cooperative Great Commission. 51. When clergy stamp out Christian activities, no matter how beneficial those activities are evinced to be, clergy claim that it is their right to do so, claiming “God’s authority” among their rationalization, while silently assuming that there is more than one mediator between man and his God. More importantly, it assumes that any “other mediator” mediator ostensibly carries the rightful authority to censor what would otherwise be God’s will. 52. When leaders, authors, clergy, teachers, and other ministers in the Body of Christ teach anything to the contraire of the clergy, the clerical system has facilitated and endorsed the most unabashed forms of gossip and it has done so without any demonstrable wavering of conscience. 53. In the past, those who opposed clergy or its system were burned alive. Today, they are slandered. At any time, only the sins of the past are repented of, never the sins of the present. 54. The lie, that the clerical system is equal to the Body of Christ itself, has so confused the masses, both Christian and non-Christian, that many people have expressed hatred toward the Church and even God Himself. Even though it is tragic that God and the Church are wrongfully branded with the results of the clerical system, the clerical system has done nothing to clarify that it was the clerical system itself, neither God nor the Church, which is responsible for the terrible things that those who are more virtuous among non-Christians rightly despise. This has been ignored as the primary “public relations” issue between the Church and the world’s image of the Church and has been given a back seat to secondary and nonsensical causes of secular hostility toward the Body of Christ. 55. When those within the Body of Christ have believed the lie, that the clerical system was equal to the Body of Christ itself, they either departed from the faith in order to escape the unbiblical methods and fruits of the clerical system or they have engaged in those unbiblical methods and bad fruits themselves, all along, having the understanding that these bad things are necessary in order to serve the very God revealed in the Bible. 56. The general confusion and frustration resulting from the clerical system has resulted in many non-Christians thinking that Jesus is evil, because they believe the lies that Jesus supports the clerical system, and this seriously hinders the Church’s ability to advance the Great Commission. 57. The clerical system was present at the time when the Baby Boomer generation was raised. Being contrary to many of the things the Bible teaches, that generation is evidence of the failed advice that the clerical system gave to the WWII generation, which reared the Baby Boomers. Yet, the clerical system has not recommended that it be reevaluated, even though many Baby Boomers, since having become professors in seminaries, have been teaching that the Church reevaluate the credibility of the Bible itself. This does not demonstrate competence on any level of those involved. 58. When Christians, passionate about the Lord’s will and eager to obey Scripture, turn away from Christian fellowships controlled by the clerical system, the clerical system has demanded that they return immediately, under the guise that they “need Christian fellowship”. Nonetheless, those within the clerical system have been wholly unwilling to abandon their clerical system in order to have fellowship with those Christians, even though those Christians would gladly receive them, thus establishing the fellowship that is claimed by the clerical system to be “so necessary”. This “one way street” of demands not only reveals the clerical system to be inept where our Lord’s command to love thy neighbor as thyself is concerned, but it also suggests that “Christian fellowship” is actually not the priority of the clerical system because the system itself, and nothing else, keeps so many loyal Christians and non-Christians away from fellowship with clerical congregations. 59. It has rejected friendships and mutually beneficial cooperation between Christians for no apparent reason other than to maintain the powers associated with territorial claim. 60. It has refused to clarify any difference between itself and the universal Body of Christ. 61. It stands silent when people confuse the clergy with the clerical system. As a result, clergy are personally offended at the notion that the clerical system ought to be altered or abandoned. Clergy often think that abandoning the clerical system would mean abandoning them. While nothing could be farther from the truth, the clerical system allows this misunderstanding and false offense to continue—an effort with the only apparent purpose of dissuading people from expressing dislike for the system or else falsely accusing dissidents of “disliking clergy” if they do. 62. It does not teach the Biblical need for Christian fellowship without describing itself as the only viable fulfillment of that need. 63. When Christians become disgruntled with it, its proponents advise those Christians that they can avoid the problems they experienced under it by returning to it, but without accounting for any preexisting and meaningful change. 64. In spite of the fact that it has so many systems which could be altered, eliminated, and other systems established in their places, it pretends to have been the “Church” established by God on the rock of Peter. This is suspiciously akin to the propaganda that Peter was the first Pope. 66. When asked to explain why it has so much bad fruit, it gives defenses to the effect that “nothing is perfect outside of Heaven”. However, in doing so, it always fails to define how imperfect something must become before it requires improvement. This begs the question of whether proponents of the clerical system are aware that, if such thresholds exist, that the clerical system would be long past the point when it should have been either fundamentally altered or utterly abolished. 67. Whenever the subject of change in the Church comes up, it acknowledges the need for change, in theory, and recommends many small or insignificant modifications, yet eliminating itself as the means of substantive change is not considered a valid means of “necessary change”, even before the idea is explored with any depth. 68. It has failed to establish prayer as the center of organized, local Christian activity, even though Isaiah 56:7 quotes God as saying, “My House shall be called a house of prayer,” and Jesus quoted the same passage in Matthew 21:13, which emphasizes its importance, considering that the Ten Commands were only given once. 69. When our Lord repeats the House of prayer statement from Isaiah, He adds, “But you have turned it into a den of thieves.” The clerical system often explains the ails of top-heavy religion, while excusing themselves from being the “den of thieves” in our modern day, despite their inefficient use of finances with expensive buildings and evermore excessive numbers of burned-out clergy on payroll. 70. Christians who leave the clerical system are branded as “unteachable”, “defiant”, “rebellious”, “opposed to Godly authority”, and other terms that implicate malice—even though they left in their desire to follow the leading of the Spirit, out of desire to love Jesus more, and, in so leaving, they feel closer to Him, which they are glad for. These actions are anything but malice and the clerical system has proven wholly incapable of acting as a sober judge concerning its opposition, as well as its ability to obey our Lord’s command to love thy enemies. 71. People who leave a system out of love for God, at worst, should be described as “doing whatever it takes to learn”, which is good, though not necessarily perfect. The fact that the clerical system labels such peace-seeking Christians with malicious implications begs the question of whether the clerical system itself has malice and is looking through rose colored glasses. 72. Though the clerical system has proven no hope of continuing in the face of the world’s problems today, nor has it proven to overcome its own problems of the past, it suggests, without end, that people outside of itself join and contribute to its cause. This indicates that the clerical system knows that it cannot survive without being propped up by the aid of those who do not need it, yet it has not abandoned its own existence. This has all the indications of a parasite that knows it’s a parasite. 73. Though leaders in the clerical system admit that, in theory, they have many problems, it is common practice to reject anyone who suggests what those specific problems may be. 74. Though leaders in the clerical system admit that their system is flawed, and that some clerical congregations can even be terrible, they make no provision for less-populated areas where all clergy-led ministries may be corrupt beyond what is tolerable. 75. All forms of hypocrisy should be avoided, including hypocrisy in the clerical system. But all evidence has shown the recurring pattern that hypocrisy is tolerated if removing it would threaten the clerical system’s power. So, the only hypocrisy that is accepted in the clerical system is the clerical system’s own hypocrisy. 76. The clerical system demands that Christians are subject to it, regardless of the cost—whatever the cost may be. 77. The clerical system does not make room nor does it give respect to forerunners, trendsetters, and people who are “ahead of the times”. Rather, the mode of operation in the clerical system is to condemn anyone who does things that are different from the norm, accusing them of “starting a cult” based on no evidence or upon twisted facts, yet, eventually, it joins those same people once their new ideas have gained popularity among the masses. 78. Though the inaccurate labels from the clerical system should discredit its ability to label people accurately, it continues to promote itself as a necessary guide and judge of truth. 79. It has established and promoted its own culture on national and global scales, confusing its false-religious spirit with the Spirit that guides the Church. 80. It has cultivated cliques under the guise of “Christian family”, which appear to be inclusive and inviting from an inside perspective, but are exclusive and selective concerning those outside of their ranks. 81. It has mimicked patterns of false religions, yet promoted itself as somehow different by changing names, symbols, fashion, architecture, and other aesthetics. 82. It treats aesthetic differences as substantive while utterly neglecting the non-religious message of the Cross, the work of Substitutionary Atonement, of Jesus Christ. 83. When subculture and creative aesthetics fails to prepare it for major shakes to its foundation, it pretends to be surprised, shocked at the fallout, and quickly seeks to fix blame on anything except its mismatched priority of culture and aesthetics over meaningful substance. 84. It writes off those who do not contribute to its culture and disturb its frail aesthetics. It promotes a gospel of its own culture over the gospel of atoning sacrifice, a culture which is wholly uninteresting to those seeking meaningful redemption from sin, wholly incapable of strengthening those who want to grow closer to the Lord, and renders itself wholly unprepared for a true test of its own validity. 85. It is a form of godliness that denies God’s power. 86. It does not judge itself by its own fruit, though, by fruit, does it claim to judge others. 87. All evidence has shown, for nearly 2,000 years, that the clerical system is unmistakably, morally ought to be, and Biblically must be regarded as Christian enemy number one. 88. Any Christian who seeks either Christian unity, Christian fellowship, Biblical fruits, fulfilling of the Great Commission, or all of these must, at all costs, abandon the clerical system, refuse to give money to that system, and retract all past support of it. 89. Loyalty to the local Body of Christ, sustainable Christian fellowship, and the belief of priesthood of all believers—both for direct prayer and discernment of God’s will for ministry—compels any sound-minded Christian that methods which prove Biblical results must be continued and methods which have, without exception, proven to have all the self-contradicting signs of a charlatan, must be abandoned and the structure of the Bible must be established in their places. 90. Christians who, under the expectable directive of a healthy and informed conscience, depart for the clerical system must remain open to any and all Christians who actively claim that those Christians need meaningful fellowship. 91. If other Christians are so concerned for the necessary fellowship of those who departed from the clerical system, then they ought to abandon any clerical system to which they may belong as a sign of their dedication to Christian fellowship and as evidence that “Christian fellowship” is not merely an excuse to persuade Christians of sound-mind to return to a system from which they were right to depart. 92. If Christian leaders within the clerical system are concerned for the guidance and Biblical teaching of Christians who depart from the clerical system, then those leaders ought to, themselves, abandon what is merely an extra-Biblical practice. In doing so, they would demonstrate their own knowledge of the Bible, showing their abilities to distinguish between things that are taught in the Bible and which things are merely extra-Biblical traditions—capabilities that ought to be present in every Christian leader. 93. By abandoning the clerical system in order to teach non-clerical Christians, encouraging them to remain outside of the clerical system for obvious reasons, Christian Bible teachers would do themselves and the whole Body of Christ a great service by naturally narrowing their pupils to those who are evidently the most dedicated to Jesus Christ and His Word. 94. Concerning Christians and Christian leaders who choose to remain within the clerical system for purposes relating to those of a “missionary” and “helping people abandon ship”, these reasons must be viewed as good and valid to those who have made the good choice of abandoning the sinking ship of the clerical system. 95. Good Christian leaders, who remain in the clerical system for good reasons, would demonstrate their insight by helping the Body of Christ to identify the difference between people who abandon the clerical system in order to live in sin and Christians who abandon the clerical system in order to break free from sin by growing closer to the Lord, as well as the difference between any system and the people in it—and which of the two is more important.